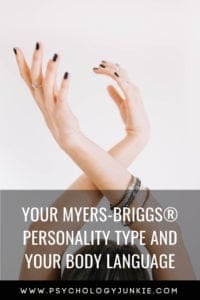 Did you know there are some external cues you can look for when identifying someone’s personality type? In this article I’m going to lay out some of the basics for “type spotting” based on body language. According to physiologists, introverts will be more rigid in social settings. They will use more closed body positions. Their shoulders tend to pull in, they will orient their bodies more away from other people, and will initiate touch less than extroverted personality types. They are more likely to cross their arms in public, and they tend to give more personal space to the person they are speaking to. They are less likely to talk with their hands, and are less likely to suddenly “explode” with laughter. They also tend to break eye contact sooner, and by looking to the right. Extroverted types tend to turn towards people who are talking and they usually use more facial expressions and hand gestures as well. They will move around the room more and talk to a wider variety of people. Physiologists also believe that extroverted personality types can hold eye contact longer, and break contact by looking to the left. SJ personality types tend to have good posture and sit and stand up straight. When they move they do so with focus and purpose – they know where they are going and they are anxious to get there. Sometimes (but not always) they can lose sight of what’s around them in their quest to get where they need to go. They usually walk deliberately rather than meandering, unless the purpose of the walk is just to enjoy conversation with a friend. ISTJs and ISFJs who have dominant introverted Sensing (Si) tend to have an intensive/focused gaze and are unlikely to let their eyes wander around the room when they’re talking to someone. ISTJs and ESTJs tend to have more fixed/tense upper lips according to typologist Erik Thor. They also tend to have more blunt and succinct movements – head nods and gestures tend to be quick and precise. SFJ personality types (ISFJs and ESFJs) have more fluid, elongated movements. They are more animated facially and tend to exude more warmth and use more hand gestures to show camaraderie. However, sometimes SFJ types fluctuate between using extraverted Feeling (Fe) and introverted Thinking (Ti). When they are using Ti they can become much more stoic and unreadable. To learn about communication giveaways for the different personality types, click here. One of the first things you’ll notice about SP personality types is that they seem attentive yet easy-going. Sensing perceivers are usually alert to their environment and they want to enjoy whatever it has to offer. They usually have the greatest body awareness of all the types and are nearly always conscious of what they are doing physically and where they are in relation to everything else. They have fluid movements and rarely bump into things or lose sight of where they are going. ESFPs and ESTPs tend to use a lot of gesticulations and hand motions in their speech and have a more animated style of speaking. However, when they are analyzing something they often appear stoic, flat or unreadable. ESTPs and ISTPs lose almost any expression when they are analyzing something and tend to look downward and disengage with people. According to typologist A.J. Drenth, “The eyes of SP types often appear wide and alert.” He also says that SP types are unlikely to seem distracted, and, in fact, they tend to “lock in” to the person they are speaking to with a steady, piercing gaze. To learn more about SP personality types, click here. NJ personality types tend to have a focused look about them. INTJs and INFJs tend to appear somewhat detached from their surroundings as they look for underlying meanings and patterns. However, all NJ types frequently drift their eyes a bit to one side and focus on something slightly downward as they think. They alternate between doing this and gazing intently at the people they are speaking to. NJs are usually less aware of what’s going on around them than sensing types. They inhabit the world of concepts and imagination and therefore are not naturally as skilled at seeing details. They may even seem awkward in their environment, bumping into things and not noticing details like the edges of tables or the beginning of a flight of stairs. Some intuitives learn to overcome this weakness, but it tends to take practice, whereas sensing types (especially SP types) move more fluidly and with less practice. ENFJs and INFJs, because they use extraverted Feeling (Fe), tend to infuse more emotion into what they are saying and have more animated, lively facial expressions than INTJs and ENTJs. Their head movements tend to be more fluid and less rigid. However, they can sometimes become stoic and unreadable in their expression if they’re trying to logically analyze something. ENTJs and INTJs tend to use quick head nods and gestures that are precise and to the point. Their movements are more sharp and they have more fixed/tense upper lips. To learn more about NJ personality types, click here. All NP personality types use a mental process called extraverted Intuition (Ne). Ne-users have very active eyes that dart from place to place as they think of ideas. Ne-users tend to have eyes that veer from side-to-side as they scan for mental information. It can appear as if they are looking for something that is lost, but they’re trying to find it in their mind, not in the concrete world. Like all intuitives, NPs are less aware of the concrete world around them. They can struggle with bumping into things, or not seeing the edges of tables or chairs. ENFPs and ENTPs are usually lively and expressive when they are talking, unless they veer into inward analysis. When ENTPs get in touch with their thinking process they tend to appear stoic and unreadable. When ENFPs get in touch with their feeling process they can appear more reserved, but their eyes will still maintain expression. INFPs and INTPs are more reserved and maintain a more closed posture and need more physical space between them and the people they are with. They are more likely to be hard-to-read than ENFP and ENTP personality types. Want to Know More About Type? Read These Other Articles!